5 am gym sessions aren’t for everyone, but there are still ways you can improve your morning healthy habits. Breakfast is the most important meal of the day as you refuel your body with the energy it missed overnight. We all love that large bowl of Cinnamon Toast Crunch, but truth is, sugary, processed cereals will not keep you filled for long. You’ll end up reaching for more than one serving or be hungry again within an hour. It is much healthier to start with something full of vitamins, protein, healthy fats, and fiber. Who says veggies aren’t for breakfast? 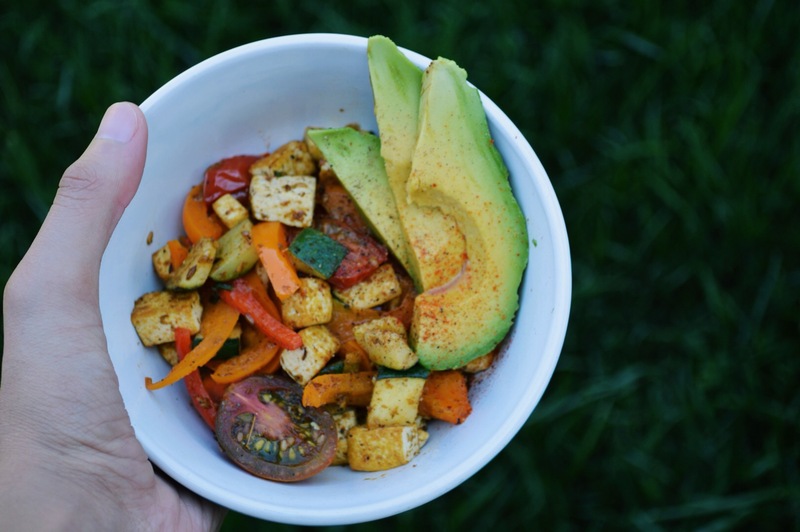 With a recommended 3 cups/day, this recipe will give you a head start on your veggie count. 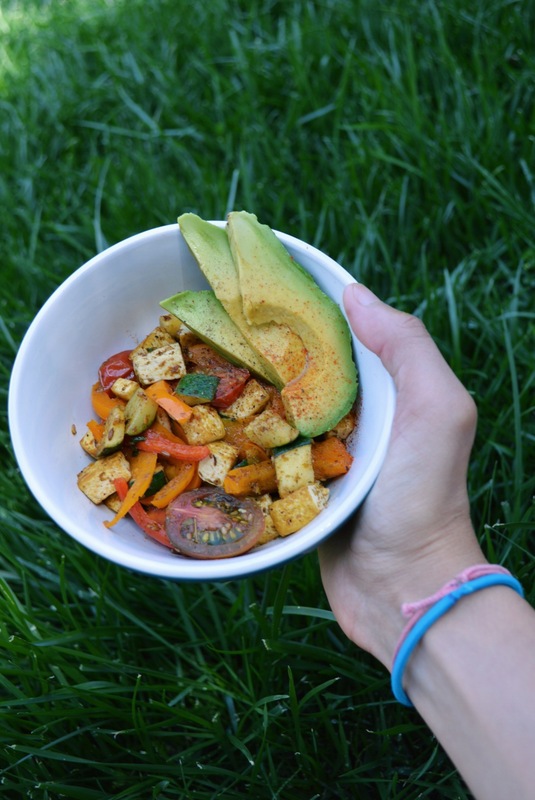 The Vegan Breakfast Burrito bowl is a savory, filling, and high protein option for breakfast. This colorful breakfast will jumpstart your day with a boost of long-lasting energy from the right kind of fuel. Best of all, it is so easy to take on the go, without the “splish-sploshing” of milk in the car. You can even wrap it in a whole-wheat tortilla if you like a traditional burrito and extra carbs for energy. 1. On medium flame, heat 1 tsp coconut oil. Once oil is hot, add in cumin seeds until they crackle. Add turmeric, and cubed tofu. Toss to coat tofu, and let cook until tofu is lightly browned. 2. Add zucchini/yellow squash and cook for a few more minutes until tender. Then mix in bell pepper strips, chickpeas, and baby tomatoes. Cook for 5 minutes. 3. Generously add in cilantro, nutritional yeast, zaatar, paprika, salt and fresh lemon juice. Toss the pan to coat all ingredients evenly. Let cook on medium heat for 5 more minutes. 4. 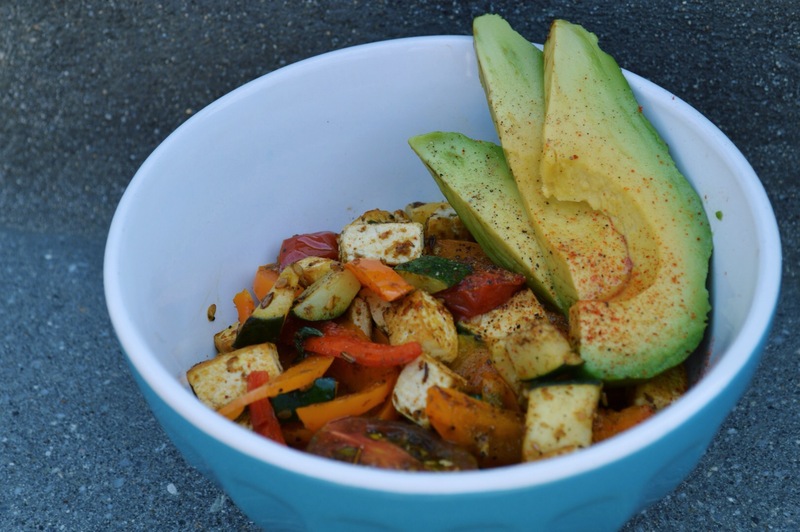 Serve hot in a bowl with sliced avocado, or mix in cubed avocado pieces–whatever you prefer! Top with freshly ground black pepper and your filling, nutritious bowl is ready to eat! Note: Experiment with your favorite veggies. I think this recipe could also work butternut squash, baby kale or spinach. Not a tofu fan? Substitute with tempeh, black beans, or chickpeas for protein. Maybe try topping off the warm bowl with some Daiya cheese (vegan version) or Tilamook sharp pepperjack (vegetarian). Customize the bowl to your liking. Just remember, the spices are what really bring the bowl to life, so don’t be afraid to use them well!